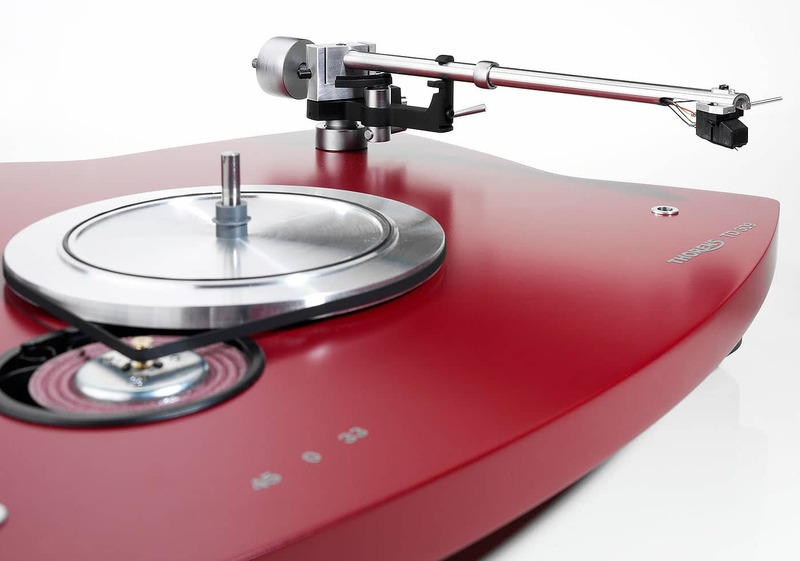 The TD309, weighing 6.5kg, is a sort of statement from the venerable Swiss (was Swiss, then German and now Swiss again) turntable manufacturer. A statement of change but also of tradition. One that looks forward while it looks back, if you will. That design statement is perfectly stated by the almost Cubist nature of the plinth: an art movement that is of the past but still looks futuristic in nature. Although available in black, I reviewed a bright red version which, if anything, only accentuated those geometrical angles and shapes. This MDF plinth sits on three suspended feet. When the deck arrives, you need to remove a transport screw from each before using. Doing so releases the spring within. 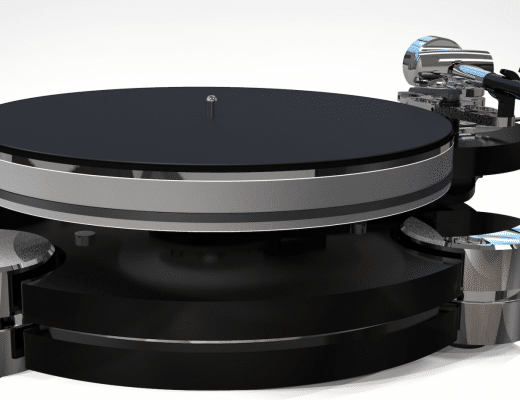 The decoupled and relatively quiet DC motor sits underneath the plinth and uses Thorens’ own flat belt that fits around the drive pulley and an aluminium sub-platter. 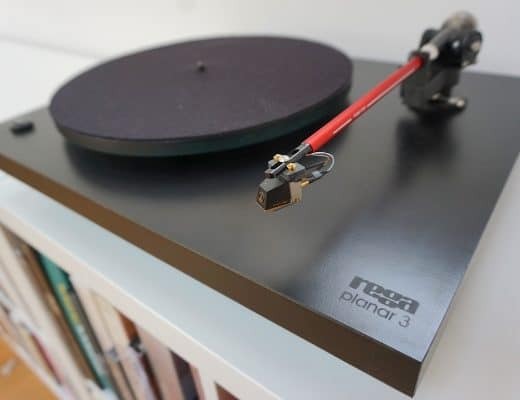 Apart from removing those transit screws and adding the belt, set-up is quick and easy, including adding the downforce weight on the rear of the straight tonearm, adding the 2.3kg glass (or “fused silica” as the company has it) platter and topping that off with a cork mat. 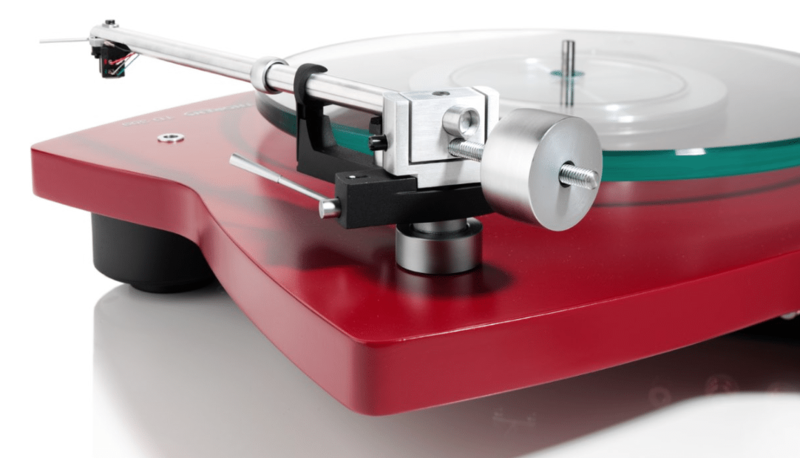 You are also given a balancing weight, a hockey puck-sized piece of metal that sits on the left of the turntable, above the front-left plinth foot, to offset the weight of the tonearm. I found the inclusion of this weight ruinous in terms of aesthetics. It’s a cack-handed solution to balancing the turntable and really, if the suspension system had been properly designed in the first place, should not have been a necessary addition. It looks like the turntable designers messed up the TD309’s design, then had a forehead slapping moment of realisation and quickly whisked up a fudged tweak to repair the situation. 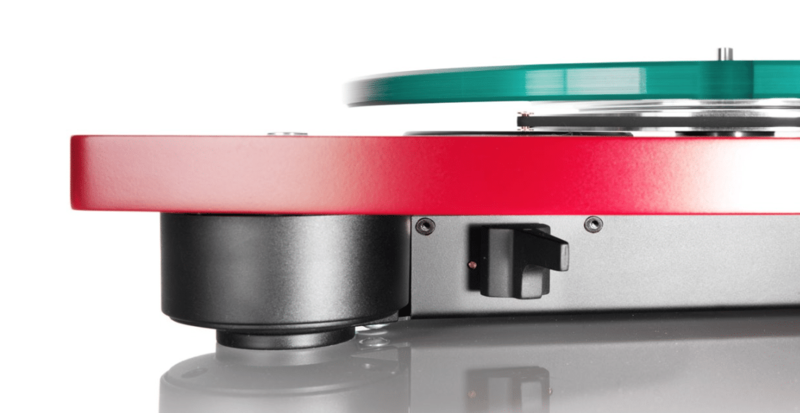 Without the weight, the turntable looks like a piece of art. With it, the TD309 looks like a shelf to store accessories, the weight being the first to be accompanied by – oh I don’t know – coffee mugs? Glass ornaments? Speed is controlled by a lever situated underneath the front of the plinth, a pleasant change from those turntables that demand you move the belt across the pulley to achieve the same result. The tonearm itself is an aluminium TD92 with a AT95B moving magnet cartridge installed on the end. At the arm tube’s midway point is an attached metal ring to reduce vibration. 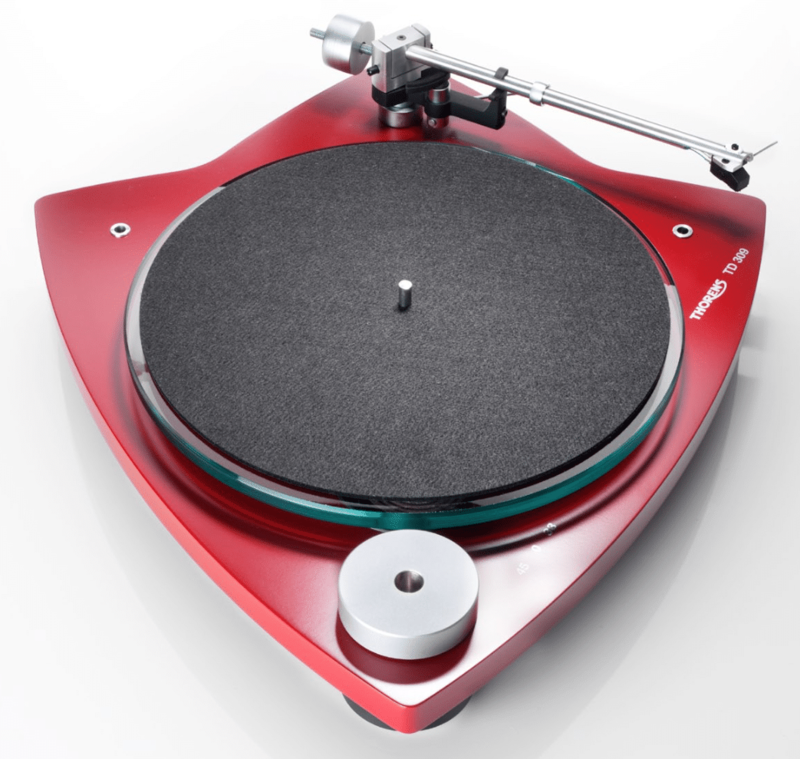 A dust cover can be fitted to the turntable which is of an innovative shape in itself. I hate the things, though. 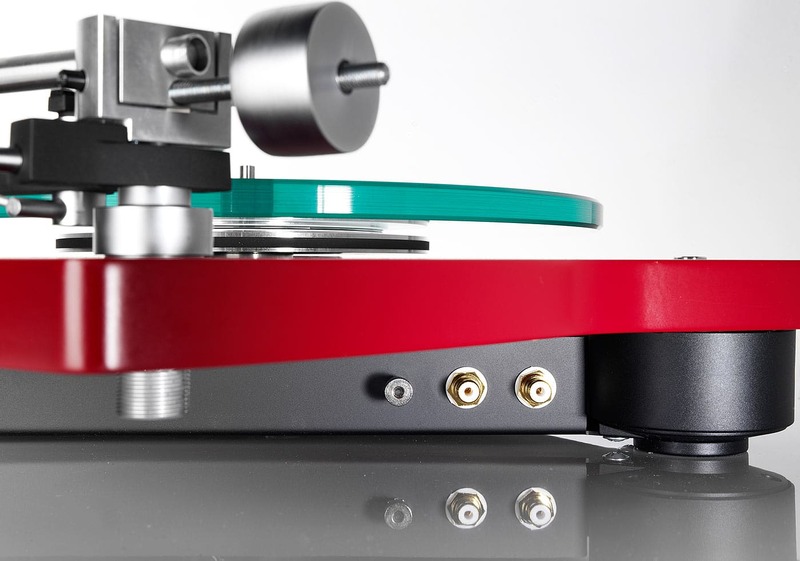 Unless they totally cover the chassis without actually touching the turntable, covers are nothing but vibration creators, harming sound quality. There are plenty of ways that you can tweak the turntable, if you so wish in terms of suspension and arm adjustment. 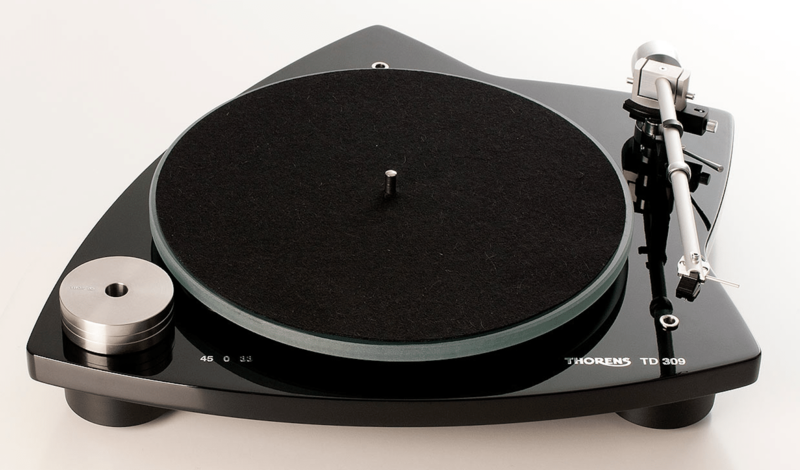 That said, Thorens provide ideal and default settings from the factory, so most users will never have to deal with those. 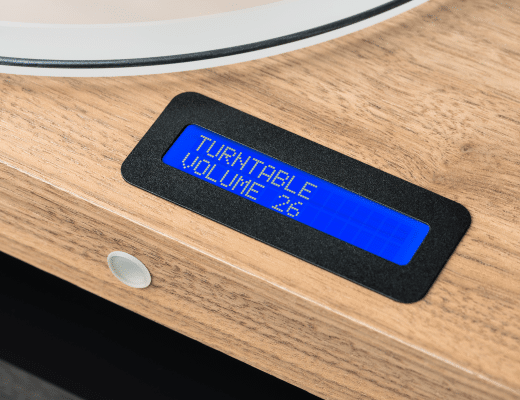 A few points regarding the design and use of the Thorens. Firstly, I would attach the separate phono cable and especially the separate Earth cable at the very beginning of the installation process instead of later on, as the instructions wish it. In this way, you will be able to tilt the plinth and give yourself more room to manoeuvre. Otherwise, you will be fiddling with the Earth wire/screw while reaching under the large plinth overhang which limits your ‘wiggle’ room. 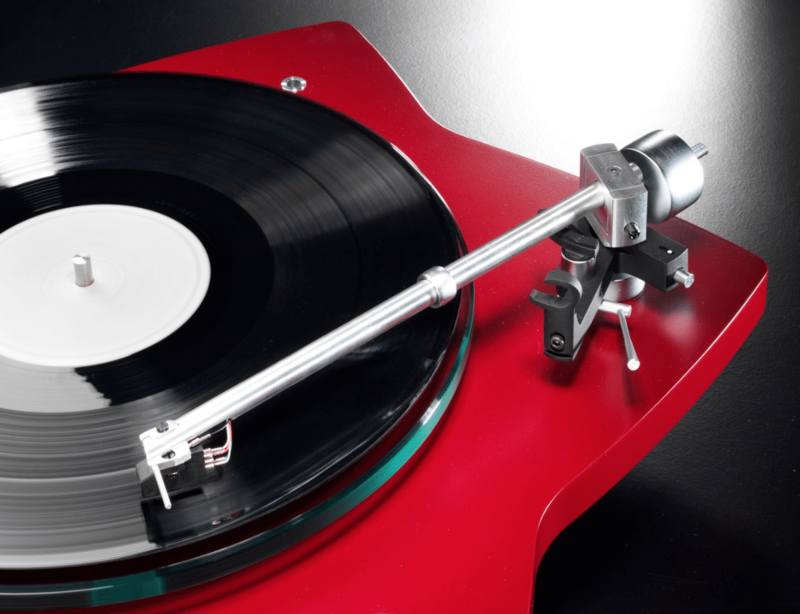 Next, when lifting the tonearm from vinyl play, push the arm firmly into the static arm securing point. If you don’t, the arm will pop out again and your stylus might hit something it shouldn’t. Finally, respect the Tri-Balance suspension system. If you strike it with a flailing hand, it will bounce all over the place, again, accidents may happen. I began with a dynamic track and prog rock from 1970 via T2 and the Decca album, It’s All Work Out in Boomland with the quite beautiful song, Circles. This is a useful test track that begins quietly with delicate acoustic guitar strums and low key bass work plus a single vocal, becoming more high energy as it proceeds with frantic percussive effects and electric guitar. In sonic terms, several points struck, me. Firstly, just how low in noise terms was the Thorens. Not mechanical noise but sonic noise. This meant that I was encouraged to increase the gain to reach my usual review volume. A great start because this meant that insight in terms of detail was automatically enhanced while clarity was all the more startling and impressive. The strumming acoustic guitar might not have produced the very best in terms of dynamic extension – I’ve heard better – but what the Thorens does provide instead is a neutrality and balance that actually gives the music a better sense of coherency. All the detail is present and correct and everything is in its place, as it where. This sense of poise means that the music never feels out of control. Frequencies never sound as if they are flailing about or on the verge of a chaotic episode. Bass also showed this aspect but I was glad to hear bass offer a full and relatively meaty response that added weight and a splendid foundation to the track. The lead vocal also benefited from the low noise presention, being clean and pure in tone with enhanced emotion and passion. As the track increased in energy, I was happy to hear that the low noise encouraged a top notch instrumental seperation. This means that the treble-induced cymbals, for example, could be clearly heard and tracked by the ear while the increasingly frantic electric guitar enjoyed a detail resonance from the plucked guitar strings. Hence, while the Thorens was well behaved, it was never staid or boring. In fact, listenability was brilliant. I could and did listen to this turntable for a long time without any sense of listening fatigue. I then turned to Nat King Cole and his jazzy ballad Time and the River. This track suffers a little from slightly excessive compression that can be heard during vocal crescendos, especially. 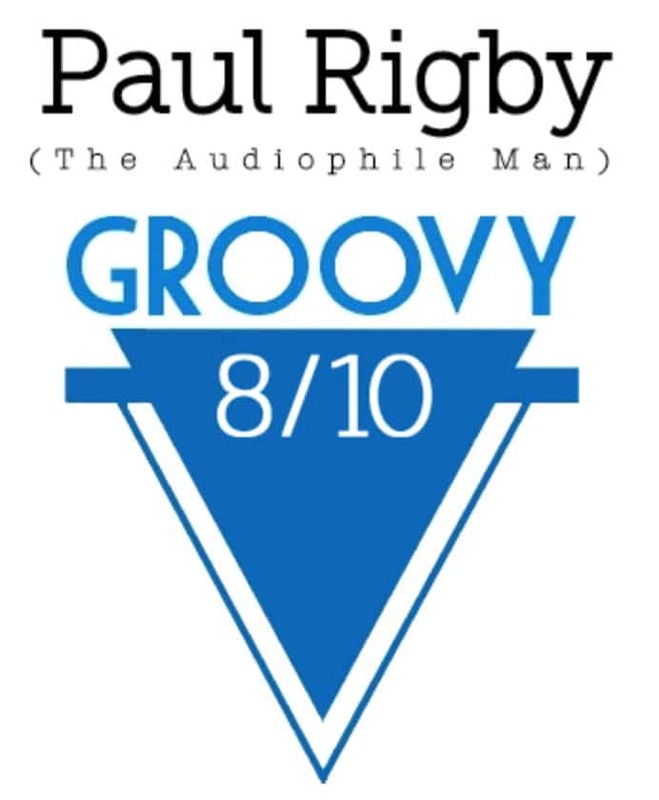 To the Thorens’ credit, though, while it told the ear that, yes, compression existed, it managed to take control of these wayward frequencies, making this track much more listenable than normal and removing much of that ear piecing wince that can sometimes occurred with this song. More than that, though, the low noise approach of the turntable added a delightful sense of clarity throughout which means that the very twangy electric rhythm guitar enjoyed enhanced bounced and vitality. Cole’s vocal, always smooth and easy to flow, was especially clear and precise here, making his performance all the more enjoyable. In bass terms, the lower frequencies enjoyed a full and strong response while, for secondary percussion, the sonic focus enabled me to hear the normally shy cowbell effect. 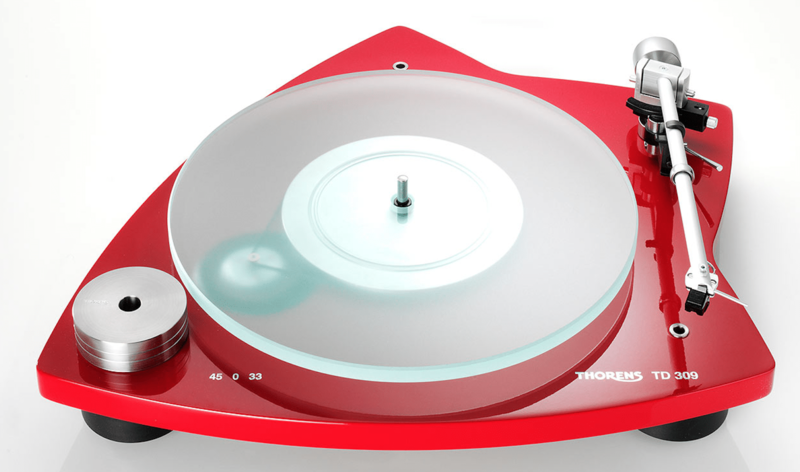 I was pleasantly surprised by the Thorens TD309. The suspension is wonderfully implemented because, even on an average shelving system, it reduces noise significantly which enhances frequencies throughout the sound spectrum giving you a focus that is a real highlight in this price point. And yet, the Thorens never sounds boring or staid. There his plenty of life and sparkle here. Yes, it is controlled within a neutrality that keeps the frequencies corralled to some extent but, nevertheless, there is plenty of zest and life here to entertain. 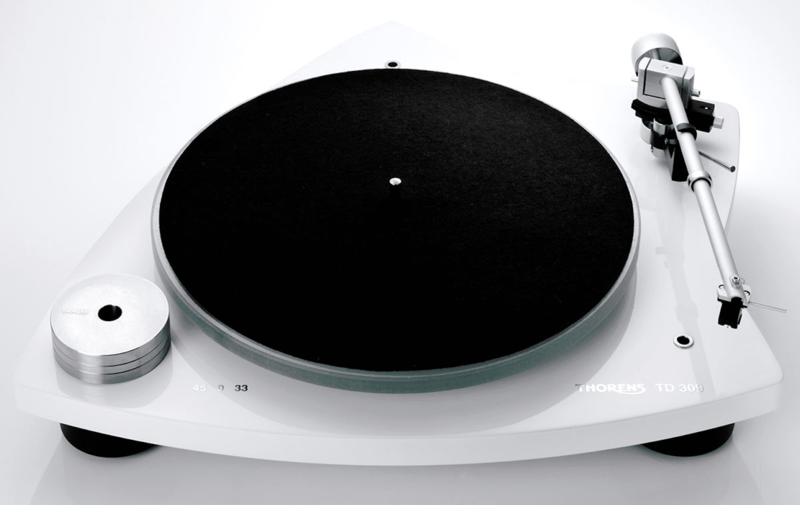 A good looking, easy to install and use turntable, the Thorens TD309 offers great value and provides a top notch sound platform.